The Wayan Gama Painter Group sits on a dusty road connecting agricultural villages not far from Ubud, Bali. At the end of a day trip that took us to a Kopi Luwak ‘poop coffee’ plantation, the Elephant Cave and Rock Cave, our driver, Mowgli, suggested that we visit the quiet art studio directed by his friend, Wayan. Mowgli explained that much of the art that lines the walls of Ubud’s shops is mass-produced, whereas at Wayan’s art school, one can mingle with the artists and see them painting, exhibiting extreme patience and a penchant for painstaking detail. We can not do great things on this earth. The man sat hunched over, with sunken cheeks, and spindly legs. 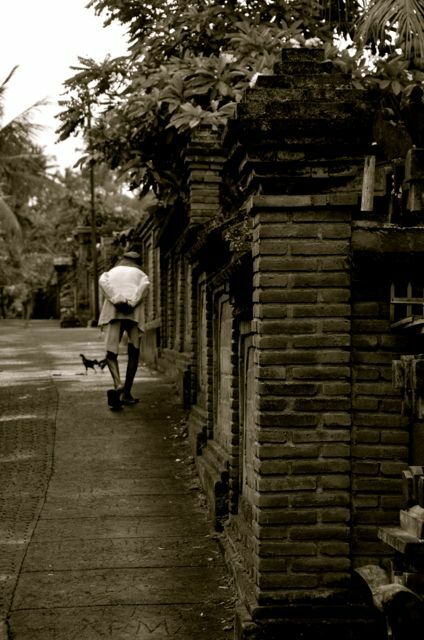 As we walked along one of Ubud’s main streets, his empty stare, meek mumbling and outstretched hand caught our gaze. Our hearts sank. I have seen many people begging worldwide, but something told Shawn and me that this old man was greatly in need. Though we had a tourist destination to which we were heading, we unconsciously tossed the plans aside. We were determined to brighten this elderly man’s day in some way. Other tourists and locals hurried by. Most of them did not make eye contact with the man. Heading to a padang (traditional fast food restaurant) across the street, we asked a group of Balinese youngsters if it would be okay to help the man. They confirmed that we could buy him some food. For 9,000 rupiah – just about $1 – we purchased some local nourishment: an egg and corn fritter, green beans, tofu and white rice. We were not sure what kind of beverage to get the man, and decided that the food alone would likely be greatly appreciated. With the banana leaf and brown paper-wrapped food package in hand, we returned to the street corner where the man was sitting. Another tourist was approaching him from the opposite direction. In her hand was a beverage. It was magical timing – a moment at which I felt as though the Balinese spirits were working to bring three very-blessed visitors and a Balinese man together. I instantly developed goose bumps and nearly shed a happy tear. Our actions couldn’t have been better choreographed with the woman, who handed the man the beverage just as we gave him the package of food. At first, the man look surprised. Then, a twinkle developed in his eyes. A wide, toothless smile blossomed on his gaunt face. We felt an instant bond with the German female tourist, given our shared experience. We briefly interacted with her and she recommended that we eat at a warung (a traditional Balinese restaurant) just around the corner. With our $5.00 meal before us, the waitress at the family-owned restaurant commented on the rice on my plate. It was formed in the shape of a heart. “Our heart for you,” she said. Since the moment with the man had been so touching, I decided that I must try to capture the kind gentleman on film. Returning to the street corner where our paths crossed, I was surprised to see that it was empty. Up a nearby, hilly street, I saw the man slowly walking. He was hunched over, with his hand neatly tucked behind him. He was carefully cradling the food package in his hand. As I passed him, I showed him the camera and ‘asked’ if it would be okay to snap his image. His smile was my go-ahead to do so. 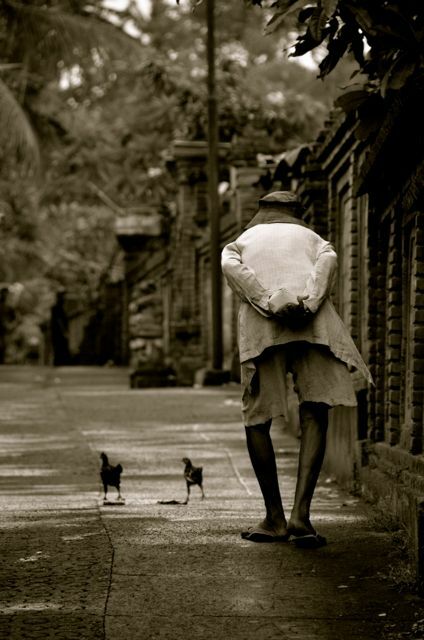 As we bid farewell, he turned a corner, going to a small home complex populated with a pair of roosters. I hope that he was going to enjoy an early dinner. It was a small gesture, but one done with love. Happy Thanksgiving.